A small cake company that bakes and delivers cakes for Birthday parties etc. The cakes have a home baked quality, are topped with icing with printed designs. To create a new brand to appeal more to women, their target customer, primarily for website. 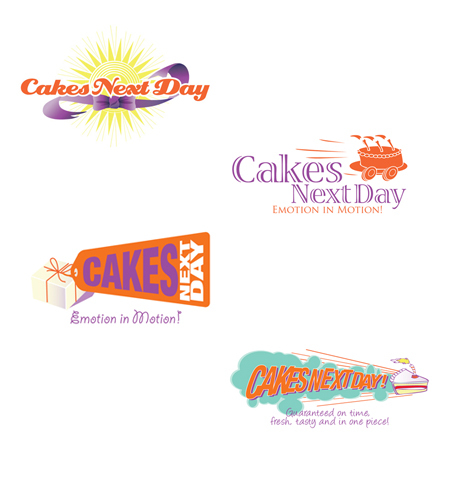 We created a number of different logo ideas focussing on the speed of delivery with the freshness of the cakes. Combined with the Website, we created a softer more feminine look and feel to the brand, which was at the time quite Masculine. We retained the company's original purple and paired it with orange that give a much warmer and more foody slant. We used baking ingredients, wooden spoon, spotty tablecloth, party snapshots, ribbons and piped icing (a prominent feature of all the cakes) along with soft colours and a scrapbook look - all to create a warm, comforting, fun and delicious home baked feel.